Accountability driven processes – the formal PM lesson observations, OfSTED grading, and individual one-off feedback (twice a year!!) – had the effect of generating show-case lessons and, generally, did not necessarily move teachers forward in the long run. We found the OfSTED grading impeded the delivery and receipt of important improvement messages and the formality of some processes inhibited innovation, risk-taking and self-motivated self-improvement. 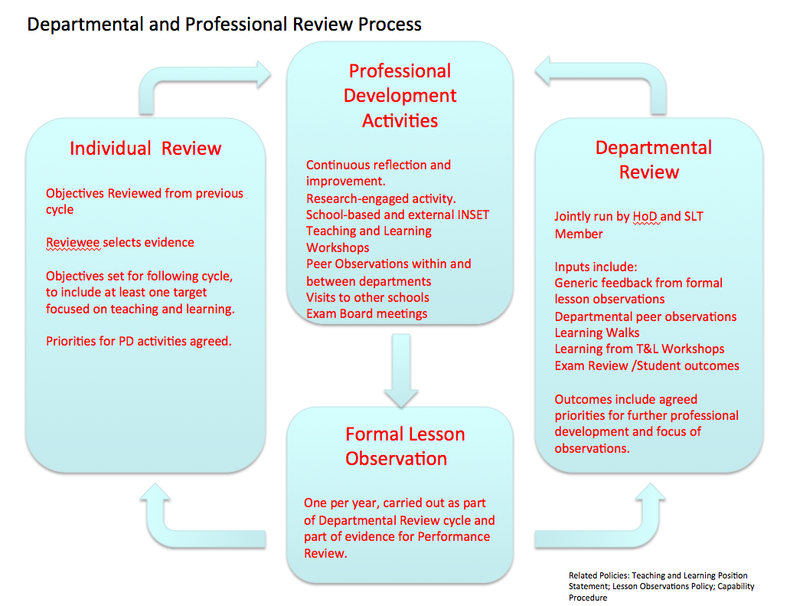 Professional Development driven processes – collaborative planning and reflection, shared departmental improvement goals, grade-free developmental feedback, peer observations and drop-in lesson observations on learning walks with informal feedback – all had a greater impact on engaging teachers with discussions about improving their practice. Having one consistent SLT person involved with each department – within and across year – helps to develop an overview of the common issues in a team. Ensuring that the The Head of Department shares the formal lesson observations is important to ensure that the actions points are owned by the team and, therefore, are taken forward with real commitment. Devoting more time to learning walks, so more everyday, organic drop-in observations take place, has given us a much better feel for how the school ticks…. the overly formal lesson observation programme never achieved this. The Departmental Review processes are not as effective as we would like in generating a sense of urgency when areas for improvement are identified. After an observation and subsequent discussion, in the absence of follow-up or a defined standard to measure against, it is possible for some colleagues to drift along without making substantial progress; they may be dipping in and out of a self-improvement process, but there isn’t always a determined, focused drive. We have concluded that we do need to use OfSTED grading within our processes; however, these need to be used as intermediate benchmarks within a wider process. They can’t be the only thing we do. At the same time ‘never less than Good’ is a helpful line in the sand. We are now convinced that rapid improvement and sustained improvement can only come from a more intensive one-to-one approach for some people. Within the collective Departmental Review process, we need individualised, differentiated approaches that employ short and long term coaching and mentoring. We need to establish a pioneer coaching group but then develop the systems in such a way that all staff are involved, trust is built and the benefits are clear to see. The use of IRIS software will help with this. We don’t want to revert to accountability-driven processes that have no real CPD outcome; at the same time, we need to have the rigour built-in with OfSTED criteria well understood as a set of minimum standards that do not sit outside our own KEGS teaching and learning agenda; our ‘Zest for Learning’ approach can continue to evolve and flourish.